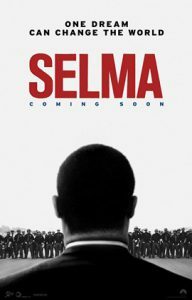 MONTGOMERY, Alabama – The director of Alabama’s Film Office hopes the state’s growing film industry will receive a boost from the critically acclaimed “Selma,” which was partially shot in Alabama last year. “Selma,” which depicts pivotal moments in the 1960’s Civil Rights movement led by Dr. Martin Luther King Jr., opened nationwide last week, earning praise and more than $11 million at the box office. The Paramount/Pathe film is backed by production companies affiliated with Oprah Winfrey, Brad Pitt, and others. “Selma” is the latest example of a major motion picture with an Alabama connection. Significant portions of “42,” a 2013 film depicting Jackie Robinson’s integration of major league baseball, were filmed in Birmingham. Mobile recently provided the backdrop for upcoming action flicks, including “Tokarev”starring Nicolas Cage, “The Prince” with Bruce Willis, and “Bus 657” starring Robert DeNiro. Gov. Robert Bentley attended a special screening of "Selma" with Kathy Faulk, director of the Alabama Film Office, and Lee Sentell, director of the state Tourism Department. For “Selma,” Faulk said film crews shot for four days in Selma, with the Edmund Pettus Bridge serving as the dramatic backdrop for a recreation of the brutal clash that occurred between Civil Rights marchers and law enforcement in 1965. Film crews spent one day in Montgomery, with the state Capitol building providing a major visual. Faulk, who joined Alabama Governor Robert Bentley at a special screening of the film last week at a packed Montgomery theater, was excited to see those scenes in the final cut of the movie. “I had chill-bumps,” she said. “Don’t get me wrong — it was harsh. It brought tears to my eyes. But it’s not exaggerated, and they did such a good job of telling the story without evoking anger. There’s no way around it: This is what happened. By contrast, we are very proud at how far our state has come,” Faulk added. Despite the limited filming that took place in Alabama, “Selma” generated the hiring of hundreds of extras in Montgomery and Selma, while also creating opportunities for production crew workers, Faulk said. In addition, hundreds of hotel rooms were filled during the week of shooting in Alabama, she said. The production certainly paid off for Stan Houston, an insurance agent based in Enterprise and an actor who had previously appeared in independent productions and projects from HBO and the FX Network. Houston landed the role of Dallas County Sheriff Jim Clark, who became infamous for his harsh treatment of those protesting segregationist policies in Selma in the 1960s. Houston initially turned down a chance to read for the role, which he had heard was going to actor Hugh Jackman. Plus, Houston was apprehensive about how he would be received playing the tough Alabama lawman. Finally, he gave into his agent’s pleas and traveled to Atlanta to read for the movie’s casting director and director Ava DuVernay. A few days later, Houston got the call saying he had the part. Playing Clark had an emotional impact on him during four weeks of rehearsing and shooting. The scenes were intense, and at one point Colman Domingo, who plays The Rev. Ralph Abernathy in the film, had to comfort Houston. While working on the film, Houston got the opportunity to meet The Rev. C.T. Vivian, a close ally of Dr. King’s, and other Civil Rights figures. He also spent time with director DuVarney, the movie’s accomplished actors, and with Winfrey. “If the diverse cast of ‘Selma’ can get along and love one another, why can’t America?” Houston asked. Alabama’s film industry has been gaining momentum since 2009, when the Legislature approved incentives aimed at increasing the state’s attractiveness to production studios. In 2013, 75 projects filmed in Alabama, spending a record $56 million and creating an estimated 4,000 jobs. Alabama faces tough competition from rivals such as Georgia and Louisiana, which have deeper incentives programs for productions. Georgia officials, for example, estimated that production activity generated an economic impact of $5.1 billion in the state during fiscal year 2014. Originally, all of “Selma” was to be shot in Georgia. That changed after Faulk sent a message to the film’s publicist suggesting that some scenes be shot in Alabama. A scouting crew traveled to Montgomery and Selma, and that changed minds. “They saw the Capitol and the bridge, and said, ‘We don’t have anything like that in Georgia,’” Faulk said.